Mirth Connect is the Swiss Army knife of open source integration engines with specific Healthcare support for HL7 message integration (though it works just as well when dealing with many types of data formats outside of HL7). Windows Azure enables you to build, deploy, scale and manage applications across a global network of Microsoft-managed data centers. Windows Azure Queue storage is a service for storing large numbers of messages that can be accessed from anywhere in the world via authenticated calls using HTTP or HTTPS. A single queue message can be up to 64KB in size, a queue can contain millions of messages, up to the 100TB total capacity limit of a storage account. By pairing an on-premise or cloud hosted the instance of Mirth Connect with Azure queues we are able to scale by having one or more instances (or channels within an instance) of Mirth Connect pushing messages to the queue while having an independent number of queue consumers receiving messages and performing business activities on them. We are also able to eliminate a single point of constraint and failure providing greater resiliency. Click the “Edit Transformer” button on the left side of the screen under the “Channel Tasks” heading. First, click the “Add New Step” button on the left side of the screen under the “Transformer Tasks” heading. The payload for the content needs to be base 64 encoded. We can do that in Mirth Connect by utilizing the encode64String from org.apache.commons.codec.binary.Base64 package that comes with the out of the box Mirth Connect installation. Windows Azure requires a specific Authorization Header to authenticate each request using a Hash-based Message Authentication Code (HMAC) constructed from the request and computed by using the SHA256 algorithm and then encoded by using Base64 encoding. 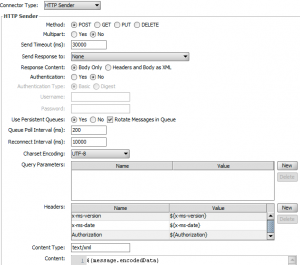 To create a transformer step to populate the “MessageText” in the payload. First, click the “Add New Step” button on the left side of the screen under the “Transformer Tasks” heading. Save the changes to the transformer and return to the Channel Editor screen. 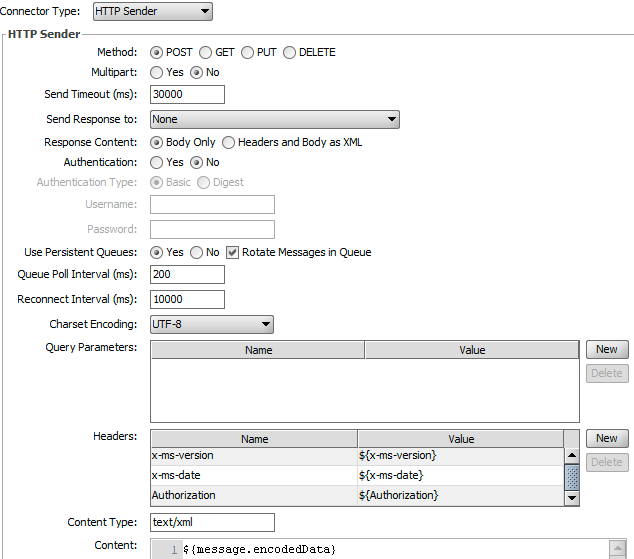 Set the headers as shown in the image below. You will need “x-ms-version”, “x-ms-date” and “Authorization”. The values for these headers are calculated and populated in the transformer step you just completed above.